Jerk spices can go on just about any food, from meats and seafood to tofu and tempeh. This mix is about as low heat as you can go and still call it jerk; add more cayenne if you want a real chile heat. 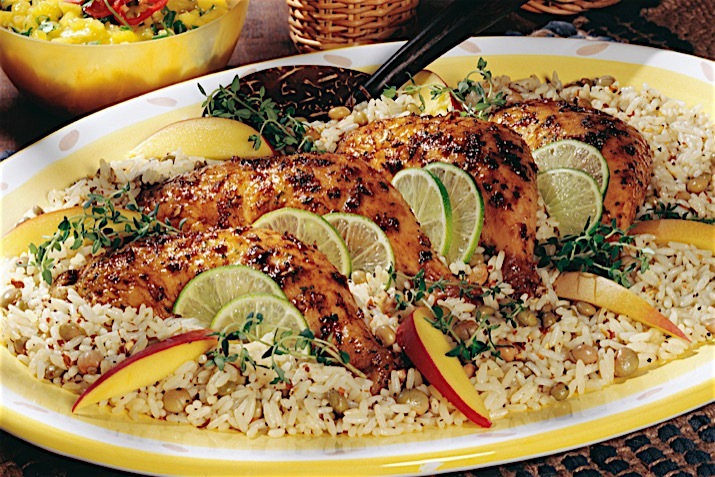 A squirt of fresh lime juice gives it an authentic tanginess and helps the spices to adhere to the chicken. Preheat the oven to 400°F. Spread some canola oil on a baking pan large enough to hold the chicken quarters. In a spice grinder or coffee mill, combine the allspice, peppercorns, cloves, thyme, paprika, nutmeg, cinnamon and cayenne and grind to a coarse powder. Add salt and pulse to mix. Makes about 3 tablespoons. For chicken, use a sharp paring knife to cut slashes into the meat, to the bone, in a couple of places on each leg and thigh. Sprinkle lime juice over the chicken and rub it in, then rub on the the spice mixture; be sure to rub it into the slashes. Place the chicken on the prepared baking sheet and drizzle with canola oil. Roast for 20 minutes, until the meat registers 160°F on a meat thermometer and the juices run clear when pierced. Serve with Jamaican curried rice, collard greens or tropical fruit.